Theater The explosive birthday. Comedy by the troupe of the Apodis. 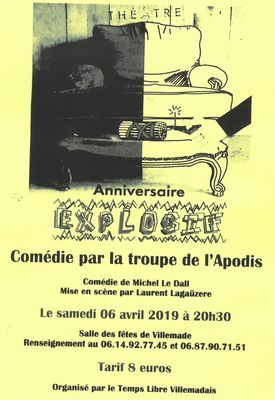 Comedy by Michel Le Dall. Directed by Laurent Lagaüzere. Saturday, April 6, 2019 at 8:30 pm. Village Hall of Villemade. Information 06 14 92 77 45 and 06 87 90 71 51. Price 8 euros. Organized by the Free Time Villemadais.